Jonathan Bulls graduated from West Point in 2011 where he earned his B.S. in Management and was a four-year member of the Army football team, garnering two varsity letters. Upon commissioning as a Field Artillery (FA) officer, he spent six months at Fort Sill, OK for FA BOLC followed by his first duty station assignment to Fort Hood, TX. There, he deployed to Kuwait, served as a Fire Direction Officer, Paladin Platoon Leader, and Executive Officer. 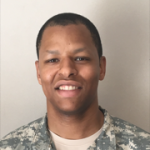 He attended the FA CCC at Fort Sill, OK and chose Fort Stewart, GA as his next duty station. He served as the Division’s Assistant Fire Support Officer. Jonathan will start his MBA at Duke University’s Fuqua School of Business in Fall 2017.